The secrets to stopping your dog pulling on the leash! Is your dog pulling on the leash? Dragging you along and embarrassing you when you take them for a walk? Relax, you’re not alone. It’s one of the most common behavioral problems. That’s not to say it’s not frustrating though. After all, walking your dog should be a fun and pleasurable experience for the two of you. Not only is it healthy, but it also has psychological benefits too. But I bet you don’t look forward to it if your dog always tries to pull away from you. In fact, you probably dread it. If your dog constantly strains at the leash, you end up with sore shoulders as you get dragged down the street. And that’s not just painful, it can be embarrassing too – although highly amusing for any onlookers! The good news is that it’s not difficult to train your dog not to do this. And once you do so, you can relax and start to enjoy your walks with your dog without hassle or stress. Of course, sometimes it can take a little time and effort, but that’s not always the case. It depends on the individual dog and how entrenched their leash pulling has become. Indeed, it often only takes as little as five minutes to sort it out. Read on to learn how to go about fixing your leash pulling problems so you can start looking forward to, and enjoying, your walks without fear of embarrassment or sore shoulders in danger of being yanked from their sockets! This is the single most important element of training your dog not to pull on the leash. If your dog is all worked up and maniacal as you set off then you’re going to struggle to get them to walk in a calm manner. So you need to make sure your dog is calm and relaxed before you leave the house. When they see you get their leash out, most dogs will get excited and start running around and jumping up and down. They’ll be bouncing around all over the place with their tail wagging and their eyes wild! And if you now put their leash on, what you’re doing is reinforcing their behavior! You’re rewarding their excitement with the reward of the leash. This makes them more excited and their behavior worse. And the same is true if you let your dog drag you out of the door and down the path once their leash is on. They’re just getting more wound up and will be close to bursting with excitement by the time you get to the path. So how do you avoid this type of behavior? It’s quite simple – you just take your time and wait for them to calm down! When it’s time to take your dog out, pick up the leash but wait for your dog to become calm before putting it on them. Ignore whatever over-excited behavior they exhibit and just do something else while you wait. 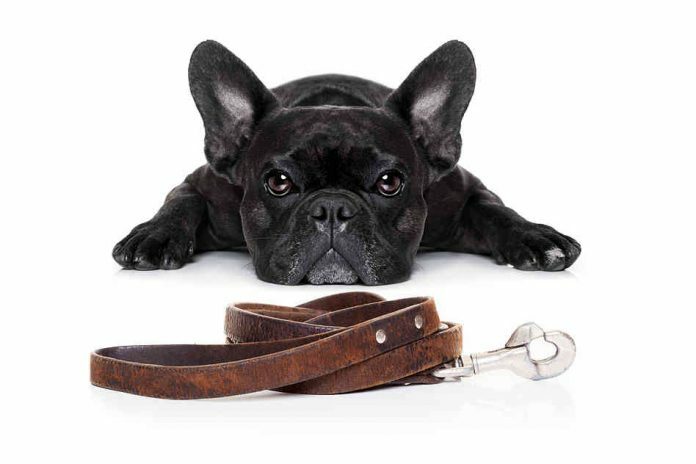 If your dog refuses to calm down while the leash is out, put it away again for a while and wait until they do calm down. Then get it out again. You may have to repeat this several times at first until you can put the leash on your dog while they’re calm. If they get excited and worked up once the leash is on, for example as you approach the path, take them back to the house. Take the leash off and put it away again until they become calm again. Repeat this process until you can get your dog to the path all nice and relaxed, ready for their walk. This can be frustrating at first, as you may feel you aren’t making any progress. But it’s far better to get the problem fixed now. Otherwise you’ll be getting dragged along the path by your dog for years to come. The problem of your dog pulling on the leash isn’t one that will just fix itself over time. You have to start the process of fixing it as soon as you can, and keep calm and patient as you do so. Once you’ve made it to the path, you may find your dog rushes off ahead of you no matter how calm they are. It’s important you don’t let them get away with this; you need to be the one in control of the walk. If your dog heads off to the right at the start of the walk, turn to the left instead. You should do this as soon as possible. Don’t wait until your dog is far ahead of you and pulling on the leash. The idea is that your dog always ends up behind you. If you turn to the left and your dog changes direction and rushes ahead of you again, turn back the other way. Repeat this until your dog stop rushes ahead and pulling on the leash. Again, this may take some time but your dog will learn in the end. There are various types of devices you can buy these days to help stop your dog pulling on the leash and get them to heel. These include non-pull dog harnesses that attach under the chin as opposed to normal harnesses where the leash attaches on the back. With these traditional harnesses, your dog can wind up pulling and dragging like a cart horse. It sounds obvious, but you have to remember that the pack leader leads! So when you’re out walking your dog make sure you act like the pack leader and lead from the front. Don’t let your dog take the lead. If your dog doesn’t see you as the pack leader, they’ll fight to lead the walk. They’ll want that front spot, and this will only result in them pulling at the leash. Learning how to be pack leader is a whole other topic and is the key to solving almost every dog behavior problem. There are lots of other little tricks and tips to help stop your dog pulling on the leash. For these you need to understand your dog and the reasons for it’s behavior. For example, you need to understand the importance of giving your dog some freedom and letting them stop and have a sniff. And of course when to let them go and have a pee! Dogs explore their environment through their sense of smell, so it’s important to give them time to have a good sniff when out and about. Of course, you should be the one in control of this, but it’s important you give them a chance to do it. If you do, they’ll enjoy their walk much more and are more likely to behave. A good tip is to let them have a mooch around as a reward for good behavior. For example, if they react well when you pass strangers and other dogs, or when a cyclist passes by. And if they learn that if they walk nicely by your side without pulling they’ll be allowed time to sniff, they’re much more likely to do so. So give them a chance to check the “pee-mail” when out on walks, especially on those oh-so-important corners! One of the main benefits of owning a dog is enjoying their company and building a bond with them. This includes when out walking with them, so don’t put up with your dog pulling on the leash any more! And remember, it’s far better and more enjoyable for your dog too, when they walk by your side in a calm and proud way. You can stop your dog pulling on the leash, so get to work on it right now!